- Noel Still Affecting Bermuda. 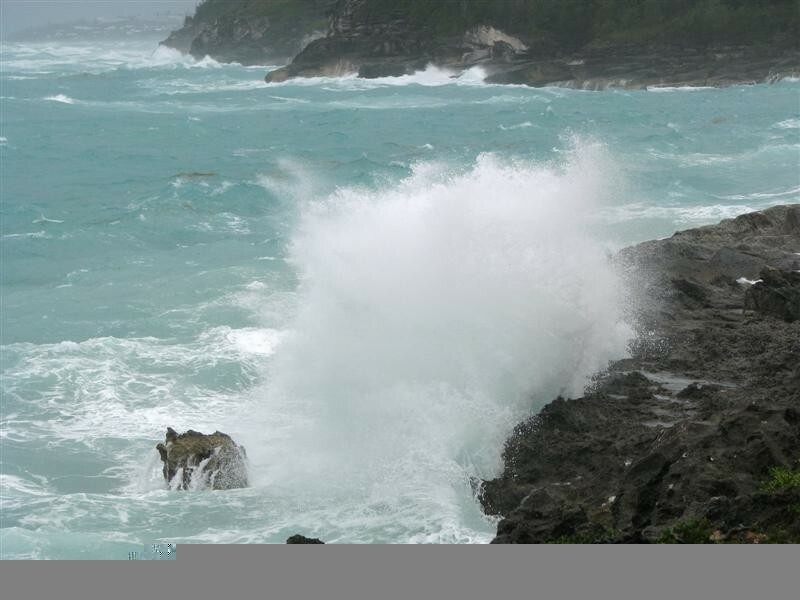 Here in Bermuda we are still feeling the wind and tropical weather from Noel the system went past late last night but the weather today is still very windy actually the gusts today are higher then it was yesterday around 50mph in higher elevations. It should start to calm down over night as the wind has started to shift from SSE more to the west. Not a heck of a lot of rain although today we have had many heavy squalls come through with very humid conditions. So far I have only recorded 00.64inch of rain the wind has been to strong to have an accurate figure. There has been some nearby lightning activity but I don't think any has actually reached the island. Things should improve later on Sunday and Monday of course will be a clear day. 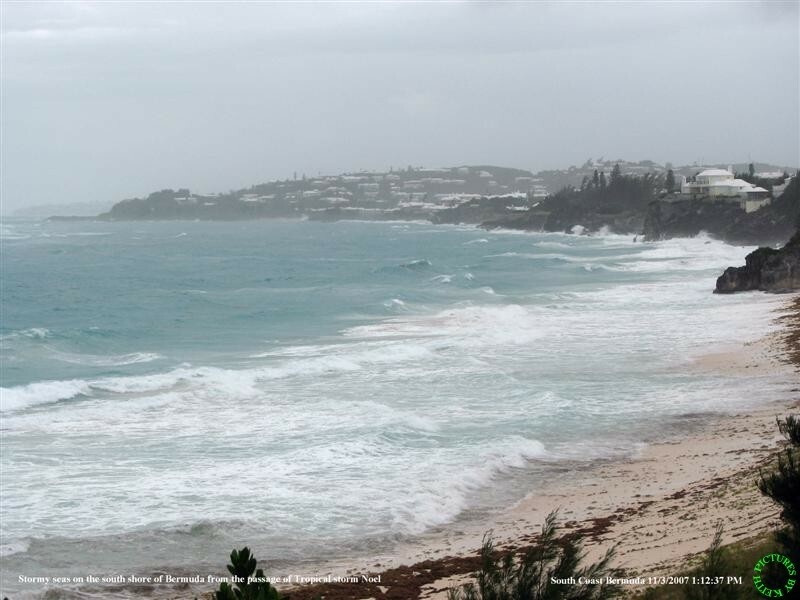 I have attached two pictures of the South Shore of Bermuda showing the heavy surf an waves etc. Hello everyone Hurricane or now Nor'easter Noel has been passing by all day today we have not experienced any real bad weather just windy with gusts around 40mph. Some rain but not much so far less then quarter inch, had some heavy squalls mid afternoon but now the wind has calmed a little, looks like we may get some more heavy rain later with gusty wind. There is a trailing front which may come through tomorrow Saturday if it does we may have more rain then we have had today so far. Other then some rough seas on the south coast its been OK here with no major affects from Noel. Normally in the months of January and February we will get the occasional winter gale which are worse then what we have received from Noel so far today. Sunday we should be back to glorious sunshine again hopefully this is the end of the tropical systems for this season. Friday in Bermuda but we are all going about our business as usual!!! the reef 3 to 5 ft... Outside the reef 10 to 15 ft...  Sunrise: 7:36 am. the reef 3 to 6 ft... Outside the reef 12 to 18 ft...  Sunset: 6:28 pm. 7:37 am; Sunset: 6:27 pm. for any reason and without notice. Errors and omissions excepted. Hello everyone, well we had a good bit of rain today (liquid sunshine as we call it here) with over an inch falling from that system that was over the Bahamas area being drawn northwards by a front coming off the east coast. By Saturday it will be sunny again as its been for the past 6 weeks with rain here and there, todays rain was the first large amount at one time for quite awhile. Glad the rain has gone by because next week Bermuda is host for the 25th PGA Grand Slam of Golf being held at the Mid Ocean Club in Hamilton parish. The weather models are showing lovely weather for all of next week the temperatures should be highs around 80-81f and lows in the mid seventies. So the weather is going to be Bermudaful next week. The golf is being broadcast live on the TNT network in HD. Those of you who have the TNT network the program starts at 4pm Eastern Time Tuesday and Wednesday 16th and 17th . Tiger Woods did qualify to play but declined the invitation because of family commitments etc. We will have Zach Johnson Masters Champion, Angel Cabrera U S Open Champion, Padraig Harrington British Open Champion and replacing Tiger Jim Furyk 2003 US Open Champion here to participate. On the ole tropical scene its been good so far this year not even had anything come close to Bermuda usually we get at least one come by close enough for some affects but nothing this year at all. The summer temperatures here in Bermuda were a few degrees below normal with a lot more rain then normal. Unlike July and August September has been very warm and dry like a late summer with lovely sunshine and lower humidity. So far we have not had any tropical systems to contend with but we may have a problem with Karen as the forecasters are indicating if the trof that's supposed to pick her up and take her on a more northerly track may not transpire. So we are monitoring her track and it won't be until early next week before we see what does affect her movements. I will update the network on any impact if any Karen may have on Bermuda hopefully none. Thats it for now take care looks like its going to be a busy late tropical season for sure. Hello to all, the weather here in Bermuda has been absolutely gorgeous the last few days with lovely sunshine temperatures in the middle eighties for highs and lows in the upper seventies at night. Very light wind if at all. The picture here just about says it all with the tourists at Horseshe Bay Beach on the south shore enjoying lovely September sun. I am keeping a watchful eye on Invest 91L down to the south east as its projected to become a tropical storm/hurricane this weekend if the predictions are correct. The early tracks have it coming on a more northerly track still a long way away so there is plenty of time to watch the progress. Hopefully it will dissipate and not be a bother to anyone. We just had the anniversary of the direct hit from hurricane Fabian September 5th 2003 with winds in excess of 130 mph claiming 3 lives, our worst storm in 50 years. September and October are the worst months for tropical systems to affect us as the storms take a more northerly track most times they either go east or west of us on a northerly track which is known as hurricane alley between Bermuda and the US east coast. Bermuda update September 7th 2007, greetings Caribbean Hurricane correspondents. 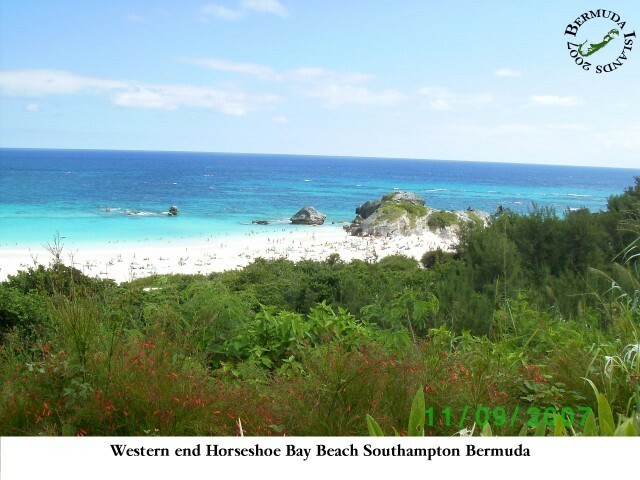 I have noticed a few postings lately inquiring about the weather here in Bermuda. Just a short update at this time after having 99L as our neighbor for the past 6 days it now appears to be getting its act together becoming the TS that its been predicted to do and thank goodness moving off to the west away form us.It was never projected to be a threat to Bermuda anyway so hopefully it will follow the predicted track. It has not affected us here other then today a little breezy our temperatures here have been very comfortable actually this summer has not been as hot as per normal, the temperature here this morning was 76f and even during the day the temperature has only been 83f with a party cloudy sky and as I said a breeze of around 15-20 knots prompting a small craft warning other then that we have not had any affects from 99L which I believe now is a TD. Our weather for the past 5 days has been rather pleasant with lower humidity and the lower temperatures the water temperature here is now in the low 80s and dry air which is not conducive to tropical storm formation. Had to smile at Miss Mermaids concern as to the water temperature around Bermuda. The weather in Bermuda this year has been very wet though we have had well above our normal in the past 8 months with August having over 11 inches of rain consequently everything is green and lush which normally this time of year would be brown from heat and dry weather. The rainfall has been particularly heavy its not normal to have such large amounts of precipitation in such a short time. As I said the temperatures this summer has not been officially over 87f and that's only for a few days at a time. So in conclusion for all those concerned no effects here from the close proximity of 99L just lovely weather a sunny weekend is forecast hopefully the humidity will stay down to make it even better. Match next week (though I don't know if I should temp fate by saying that!)! thunder is now rumbling across the Island. That said, we'll take the rain! weather we see this season! Its been a while since Bermuda has checked in hopefully you are all well! That said, we'll happily accept the water to top up our tanks!